Chooks-to-Win Promo ~ Philippine Freebies, Promos, Contests and MORE! 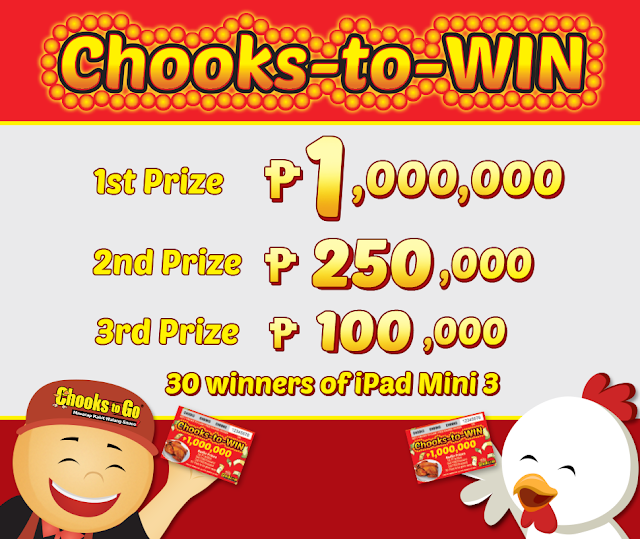 Get a chance to win HUGE cash prizes, exciting gadgets and delicious chicken treats in Chooks-to-Go's Chooks-to-Win Promo. Buy one (1) Whole Oven-Roasted Chicken of any variant (Sweet Roast, Pepper Roast, or Fried Chooks) or Juicy Liempo to be entitled to one (1) Chooks-to-WIN raffle coupon. There are two (2) ways to win. First is through raffle. Simply fill out the half part of the coupon with your contact details and drop it in drop boxes located at the counter of any participating Chooks-to-Go outlet. CASH prizes at stake are P1 million, P250,000 and P100,000. For the 4th to 33rd winners, each will receive a 16GB iPad Mini 3. You can also win instantly by simply scratching the Chooks-to-WIN Scratch Card. If you get three (3) "Chooks" lined up consecutively, present it to the store crew to receive your one (1) FREE Whole Oven-Roasted Chicken of any variant (Sweet Roast, Pepper Roast, or Fried Chooks). Open to all customers of Chooks-to-Go nationwide.